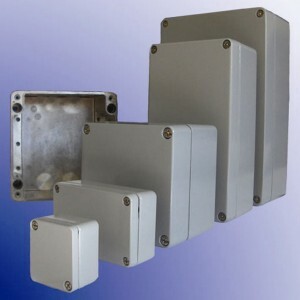 CEA aluminium enclosures are supplied with protection to IP66 as standard and IP67 or IP68 as options. CEAs are available in over 30 different sizes from – 50 mm high x 45 mm wide x 30 mm deep to 400 mm high x 310 mm wide x 110 mm deep. These Si 12 alloy die cast aluminium boxes whilst light weight, offer high impact (IK08) and corrosion resistance. Finish options include: unpainted, painted grey (RAL 7001), a hard anodised sea water resistant coating, linished and RFI shielding for EMC compliance (2004/108/EC). +130º C by means of an optional silicone gasket. Cable entries can be drilled on-site or factory machined by CE-TEK prior to delivery. CEA enclosures can also be supplied as empty enclosures, pre-assembled with terminals and internal/external earth stud or populated with terminals to your specification. Available with ATEX Directive Ex e, Ex ia and Ex ib certification and a temperature classification of T5 or T6 (see CEA Ex e webpage for more information). *CEA281810 is LU approved for LV power cabling applications (LU-APR ID 4791).